As an email subscriber, you see our promotions before anyone else. This month you'll save with our Save Up to $3,750 off Furnace & AC | $1,200 OFF Electrical Basement Finish | $1,499 Emergency Generator | $1,500 OFF Rooftop Solar | Other Offers. Thank you and call us if you have any questions. A pretty substantial portion of our monthly utility cost go to heat and cool our homes. Summer is the highest because of all the motors involved with running your air conditioner. Through substantial rebates available through the gas company, power company, manufacturer incentives, and $1,200 OFF at the time of purchase compliments of Any Hour Services. If you want to find out how much a new energy efficient Furnace and Air Conditioner would cost, call now and schedule a free visit with one of our HVAC supervisors. With financing options available, the money you will save each month on utilities can offset some of the cost of your new system. If you are trying to save money by finishing your basement and acting as your own contractor you are probably feeling frustrated trying to find tradespeople that are willing to come out to your home and help you with your basement project. 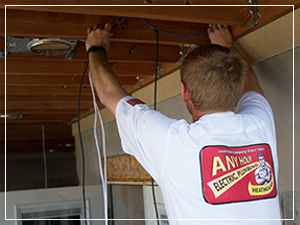 We have our own electrical install crews that can help solve that problem. Step 2 - A supervisor from our electrical department will walk through you, discuss your electrical needs, and quote you a price. Step 4 - After you drywall and the paint is done, we’ll come install the outlets, switches, and fixtures. It’s that easy and if you call and schedule a time to meet with one of our electrical supervisors and when they quote you the price they will take $1,200 off the project. But you need to call and schedule your appointment during the month of April to get the $1,200 OFF. If you’ve ever looked into getting a backup generator for your house, you’ve probably found they can be a little expensive if you want them to turn on automatically and run your entire home when the power goes out. And while they do make systems that can do that, you may only be interested in running the basics. You may think your only 2 options are the big expensive system or running extension cords off a portable generator in through the window. Well, the good news is there are many options available in different configurations and price ranges but it all begins with a visit from one of our electricians. The visit is FREE and they will walk you through the process of figuring out what these essentials are, what size system you’ll need, and how much it will cost. Right now out “Just the Essentials” generator package is marked down $300 and includes the generator, manual disconnect, electrical connections from your electrical system to the generator, installation, and training on how to use the system. We also have large systems that will run your entire home if you want and anything in between. 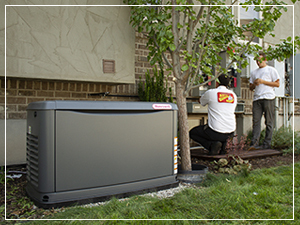 Click here to read more about things to consider when choosing the generator that's right for you. Call now to schedule a FREE visit to find out what options are available. Here’s the thing, if you think you might be interested in solar, you need to talk to someone as soon as you can. The reason for the urgency is the Federal Tax credits are set to decrease after this year and you don’t want to be stuck not qualifying for them because you waited till the end of the year and there was a wait that pushed your system back to next year. 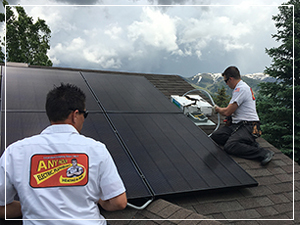 We’ll make it super easy for you, one of the solar pros from our electrical department will come to your home and show you what options are available, and show you how you can save money on your utilities each month. They are electricians first and foremost so your visit with them will be straightforward and fact-based. The visit is FREE and during the month of April we are offering $1,500 any residential rooftop solar system. Call now to schedule a time to meet with one of our solar pros. WHAT ABOUT BATTERIES? — yeah, we install those too. The technology is great and they pair seamlessly with your solar system. Let the electrician you meet with know you are interested. Any Hour Services would love to answer any questions you have about rooftop solar including how it’s installed and how much you could save each month--absolutely free. With so many solar companies to choose from, click here to read more about what to consider when making your final choice.